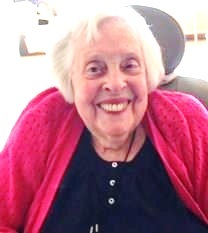 Mary Frances (McMillan) Abrahamsohn has joined her beloved husband, Al, in heaven, and the Lord to whom she was very devoted. Mary and Al enjoyed 66 years of loving marriage and had 8 children. Mary was treasured mother of Rosemary (West), George, Linda (O’Connell), Donna (McCurdy), Lori, Teresa, Paul and Michael; loving grandmother to 14 and sweet great-grandmother to 12, plus mother-in-law, aunt, great-aunt, sister, sister-in-law and cousin to many whom she treasured and nurtured throughout their lives. Mary also had many, many friends who are saddened by her departure. She made new friends every day and offered kindness and love to all the staff and residents at the Carlton Plaza where she lived. Mary was born in Eureka, CA, weighing just 3 pounds. Her survival was a miracle for which Mary was always grateful to God. Mary grew up surrounded by a large, loving family who taught her the value of faith, family and friends, which were her great passions throughout life. She moved to San Francisco at 13 and eventually befriended Al’s twin sisters through whom she met Al when she was 27 years old. Mary was born with a disability which made it difficult to walk but she never let it stop her or change her positive outlook. She relied on her deep faith, strengthened by her baptism in the Holy Spirit via the Catholic Charismatic Renewal , through every trial and inspired many with her faith and concern for them. Mary loved to make people laugh, tell stories, and provide words of encouragement and prayers. She and Al had many ministries, friendships and activities, through which they spread laughter and God’s love. Mary will be missed by many but we will continue to feel her loving care. Services: Visitation on Fri. Jan. 12 from 4 pm to 6 pm and Vigil Service at 7 pm at Holy Family Parish, 4848 Pearl Ave, San Jose. The funeral Mass, also at Holy Family, is Sat. Jan. 13 from 11 am to 12:30 pm. A luncheon reception follows at Transfiguration Parish, 4325 Jarvis Ave, San Jose. In lieu of flowers, donations requested for Martha’s Kitchen (marthas-kitchen.org), Sacred Heart Community Service (sacredheartcs.org) or Catholic Charities of Santa Clara County (catholiccharitiesscc.org).